The Otto Tuning Forks can either be purchased seperately or as a three piece set. The 32 Hz., the 64Hz, and the 128 Hz. The Otto tuning forks are used to send vibrations deeper into the physical body, right to the very bone-as it were. The lower the frequency, the deeper into the body the vibrations travel. You can also use the Otto tuning forks to align the chakras and auric layers of the body, meditation, grounding, to recover from physical and emotional trauma, and to restore tone to body tissues, etc. You can use the Otto tuning forks directly on the sternum, vertebra and the meridian points of the body. You can purchase these fork individually or together as a set to save $$$. Cost: $139.99 plus $13.99 postage for U.S. delivery only. Cost: $44.99 plus $13.99 postage in U.S.A. 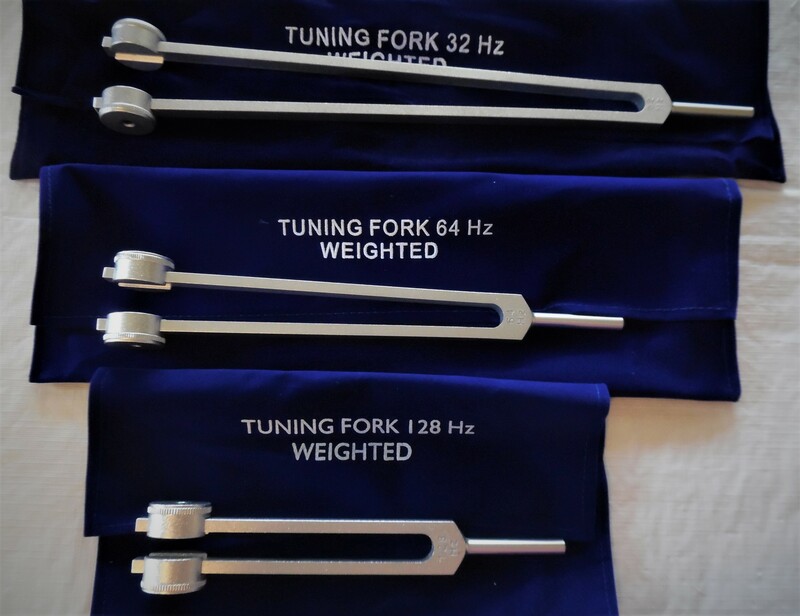 Cost for 64Hz Otto tuning fork is $44.99 plus $8.99 postage in U.S.A.
128Hz Otto tuning fork only. Cost of 128Hz Otto tuning fork is $42.99 plus $6.99 in U.S.A.